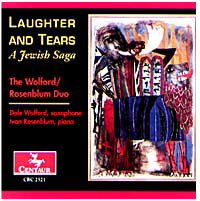 Laughter and Tears expresses both the joy and sorrow of Jewish experience—from shtetl to Holocaust—from Old Testament story-telling to early 20th century Yiddish vaudeville. Klezmer inspired music of the 1930’s weaves throughout while a synagogue prayer precedes a musical portrait of Israel. The program includes works by Irving Berlin, Elwood Derr, Carl Wirth, Ivan Rosenblum, Paul Ben-Haim and others. Joining the Duo are the following fine artists — Kathleen Nitz-soprano, Sylvie Braitman and Stephanie Friedman, mezzo-sopranos; saxophonist Bill Trimble, and actress Erica Lann-Clark. Incredible variety and you don’t have to be Jewish to enjoy this CD! "The range of feeling exhibited by all the selections of music, both purely instrumental and with voice, is particularly evocative of the length and complexity of Jewish experience... All in all, this is a rewarding smorgasbord of Jewish temperament expressed in highly professional and creative musicianship." Paul Wagner - Saxophone Journal, July/August 2004.